This is a full coilover kit for the front and rear of your vehicle. &###xA0;VAUXHALL OPEL VECTRA C. Opel Vectra C, - GTS, - Caravan, type Z-C. Thread adjustment block is located on the spring. 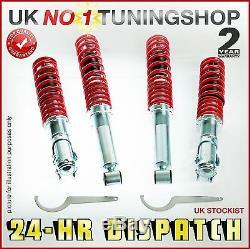 UKno1Tuningshop coilovers can be &###xA0;lowered, from -20mm &###xA0;to -90mm in front and rear -40mm to 70mm. All coilover systems include high grade aluminum pillow mounts further enhancing overall control. CNC Wound SAE 9254 Racing Springs are used which were found to be the longest lasting spring on the market that showed no tendencies to sag. Extensive Research And Development Went In To Choosing Precisely&###xA0;Matched&###xA0;&###xA0;Spring & Damper Rates Specific To Each Application. So whether you are looking for a great track set up or you need a suspension that adapts to public roads, you have found the right coilover. UKno1Tuningshop, Designed and manufactured for customers who demand the very best! &###xA0;&###xA0;&###xA0; &###xA0;Superb Overall Control. &###xA0;&###xA0;&###xA0; Height can be adjusted without affecting shock stroke length. &###xA0;&###xA0;&###xA0; &###xA0;Both Track Abuse As Well As Road Imperfections. &###xA0;&###xA0;&###xA0; CNC Wound SAE 9254 Super High Quality Springs. &###xA0;&###xA0;&###xA0;&###xA0; Kit includes: 2 front full coilovers, 2 rear uprated sport shocks + lowering spring, adjustable platforms, and a c-spanner. Is this a complete kit? Yes this is a complete suspension kit for all four corners of the car. Does this fit my vehicle? This kit will fit the vehicle listed in the first table above. What kind of quality is this kit? This kit is of comparable quality to units offered by Gmax, Pi, FK, Weitec and Jamex. The shocks are approx 30% uprated over standard. FEEL FREE TO CHECK OUT OUR FEEDBACK!! OUR CUSTOMER SERVICE IS #1! We're a genuine UK based company offering quality items at prices far cheaper than the high street. We warrantee and represent that the goods are as described in the above listing. We specifically disclaim any implied warranties of title, merchantability, fitness for a particular purpose and non-infringement. Customers should satisfy themselves that any item choice made is suitable for their intended purpose or use. We pride ourselves on our customer service. PLEASE NOTE ALL ITEMS MUST BE INSTALLED BY A QUALIFIED MECHANIC AT A REGISTERED GARAGE. &###xA0; so please make sure before fitting any part supplied by us, that it is conforming to the standards to fit the purpose. We do all our listings with great care and having experience of the trade, but still we will not accept any liability for any damage, loss in any form like financial or what so ever. Also you have to pay the transport that we have paid to get the item to you. For uk mainland parcel until 15kg is 15 pounds, from 16-30 kg its 22 pounds. Once we receive the item back in stock in? This listing is currently undergoing maintenance, we apologise for any inconvenience caused. The item "COILOVERS VAUXHALL VECTRA C 1.9CDTI 2.0DTI 2.2DTI 2.0DTI 3.0CDTI" is in sale since Friday, December 14, 2018. This item is in the category "Vehicle Parts & Accessories\Car Tuning & Styling\Performance Suspension\Other Performance Suspension". The seller is "ukno1tuningshop" and is located in CANTERBURY. This item can be shipped worldwide.